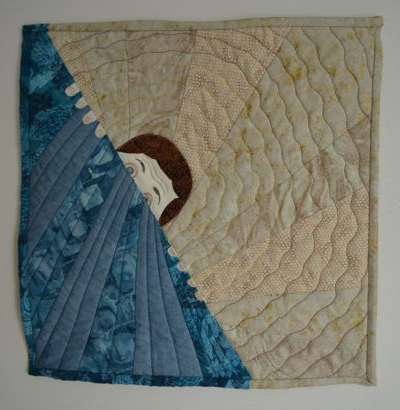 Explorations in Quilting and Life: SAQA Auction approaching! Once again the SAQA Auction is almost upon us. The auction is the largest yearly fundraiser for SAQA and I have contributed a quilt for the past three years. The online Auction begins a week from today on Monday September 10. Link to the Auction details. In addition, a selection of the quilts will auctioned at the IQF in Houston in November. There are always several hundred quilts, all 12 inch square, to choose from. SAQA has some of the most amazing artists so be sure to browse early and pick a few favorites to bid on. I decided to have a bit of fun with my entry for this year. I call it "I spy." It is up to the viewer to decide what our friend might be looking out upon.